Monday March 9 1908 I did some working in the forenoon and got the house in order I got ready to go in town at 2.10 but Mr [Shick?] came along and asked me to ride. I was at Otts office and to Dr Smiths. I came home at 4.30 I did not have time to stop at Woolfs. 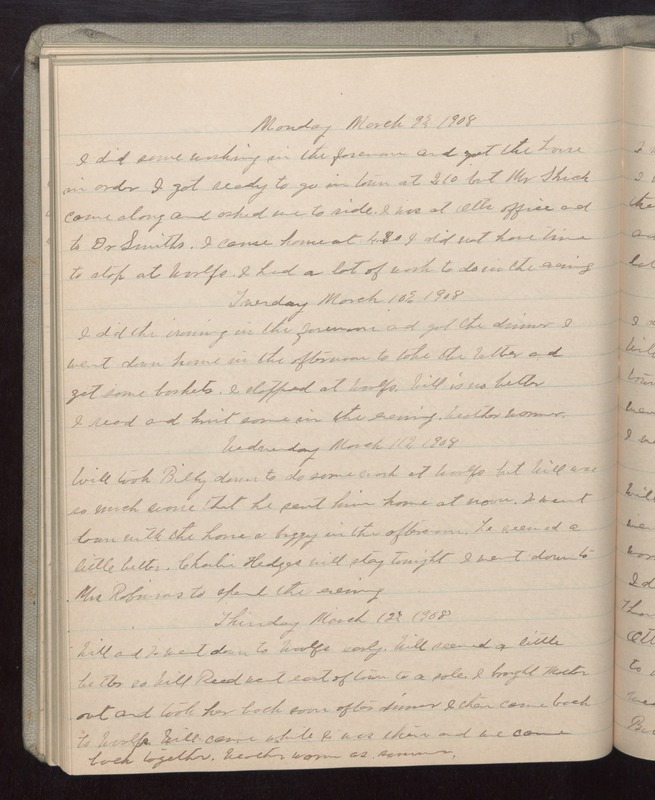 I had a lot of work to do in the evening Tuesday March 10 1908 I did the ironing in the forenoon and got the dinner I went down home in the afternoon to take the butter and get some baskets. I stopped at Woolfs. Will is no better I read and knit some in the evening. Weather warmer. Wednesday March 11 1908 Will took Billy down to do some work at Woolfs but Will was so much worse that he sent him home at noon. I went down with the horse & buggy in the afternoon. he seemed a little better. Charlie Hedges will stay tonight I went down to Mrs Robinsons to spend the evening. Thursday March 12 1908 Will and I went down to Woolfs early. Will seemed a little better so Will Reed went east of town to a sale. I brought Mother out and took her back soon after dinner. I then came back to Woolfs Will came while I was there and we came back together. Weather warm as summer.